PepBoys is named after its three founders Manny, Moe & Jack. It is a one stop service and tire automotive aftermarket chain. Apart from being a commercial auto parts dealer, It is also well known for its capabilities in vehicle maintenance and repair. Pepboys was listed in Top 500 fastest growing companies in the US. Started in 1921, today the PepBoys has over 800 stores with approximately 7,500 service bays in 35 states. It is headquartered in Philadelphia. If you have a PepBoys complaint, customer service can be reached via mail at contactus@pepboys.com or can be contacted by phone at 1-800-PEP-BOYS. Common problems usually relate to auto parts, tires and other related accessories. Apart from these they also offer full-service auto repairs and maintenance under the expertise of ASE certified technicians. Over the last four years I have observed a manager at store # 0175 in willowgrove named Bob Thompkins behave in an unprofessional way towards his employees and on occasion ignore customers. I have been a loyal customer of this store , However; I can not continue to watch good helpful and and tentative employees be mistreated with foul language and attitudes especially in public. As a Mgt of a hotel this is not acceptable behavior for Management. I do hope you investigate further cause moral is very low when he is on the premises. changed but we got charge for them I left the car to pick it up today and to my surprise when I went to pick it up I checked the air filter and it was not changed either but we got charged for it. What it did surprise me is how light this was taken by the managers, on the way back to my company I notice that they didn't aligned the car either. I will appreciate if someone contact me at my email to get this issue solved. I don't want to take this any further and I'll appreciate your prompt assistance. The vehicle belongs to the Army Air Force Exchange Service and is consider a DOD vehicle. Received 30% off email so I went to the above Pep Boys to get my oil changed. The girl was very nice and started the paperwork for me. She then told me the Pep Boys computer said my car called for synthetic engine oil. I showed her it call for sae 5w-20 standard oil, non synthetic. She goes and gets the man that says he was the manager. I think he said his name was Robert. He then proceeds to tell me they didn't make the oil I was showing him in the owners manual that it called for. So I was reading to him what the owners manual said and showed him the invoice where they had changed it before, and an invoice that Dodge had changed it with 5w-20 standard, what it called for in the owners manual. He told me to take it to Dodge, because that was not what his computer called for. Then told me he didn't appreciate me talking down to him like he was stupid. I said you are acting that way. He then told me to get out of the store. On March 25 2019 I went to the Pep boys on 2321 west expressway 83 in Harlingen,Tx. I got there at 7:30 am. I was the first one there that morning. I told the employee I needed an oil change and rotation of tires. I asked him how long it would take, he said from 1 hour to 1 1/2. He asked for my phone number to call me when it was done. Well like usual they never bother to call you,so I called them after 3 1/2 hours. The employee that answered the phone told me that they received a customer that had an appointment at 8:00 so they took him first. He told me it would be another 30 to 45 minutes before it would be done. He said they would call me. After 2 more hours of waiting I called again, they told me the truck was ready but didn't bother calling me again!!!! When I picked up the truck I complained about the whole situation. They said they were sorry. Took the truck home and found out that they didn't even rotate my tires even though the receipt said they did it. I marked the rims with a marker on the front two tires. This is not the first time they do this as I have marked them before. I have been a faithful customer for 5 years but I will not go back again. Giving my business to somebody else. A month later fluid leaking again, took it back to shop. This time they said I needed new rack and pinion for about $1000.00 I said NO. Something felt wrong, smelled bad. I called my mobile mechanic and scheduled appointment. I would normally have used him in first place but needed car fixed quickly so family member could borrow it to take another family member to the massive Dr. appointments he had after having brain surgery in December. He usually takes 2 to 4 weeks to get appointment due to high demand as he is HONEST. His findings? 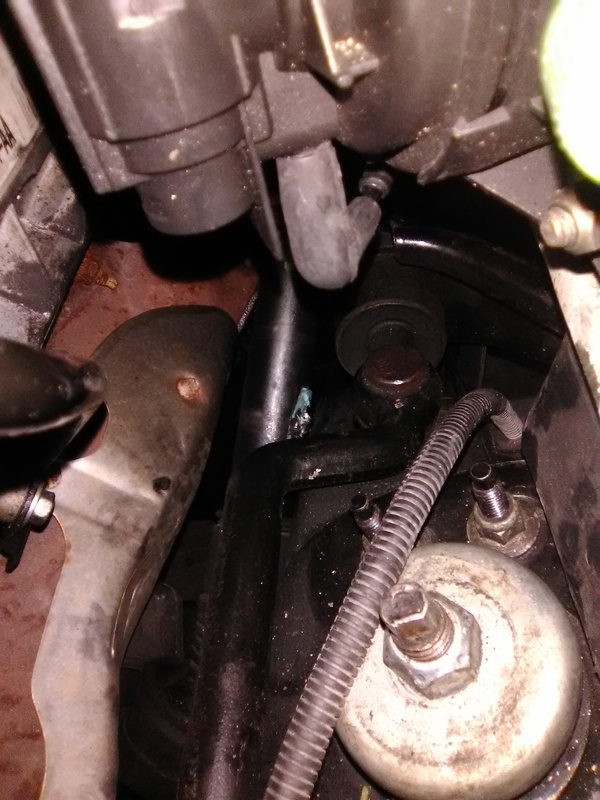 Power steering hose installed improperly in January. And your shop was telling me rack and pinion for a grand? Dishonest at worst, incompetent at best. I have posted on both neighborhood sites I use to not use your shop for ANYTHING. Not even an oil change. Plus I'm out $155 paid to good mechanic to fix your mistake that was under warranty. Attached are pics of receipts and before and after pic of hose fixed. Pathetic way to do business. Counter man has questionable ethics. Also questionably inadequate skills, demeanor and professional appearance. A bully also. Quote was $1100 over estimate from a second repair shop. Would not honor corporate online discount for oil change. I am disgusted at how I was treated. Second visit to this store. Bully-like treatment also on the first visit by the same counter man. Why should I make a third visit? I recently bought a 1997 BMW 328I. I went to buy oil for it at Pep Boys and asked what oil I needed to buy, I told her the year make and model and explained it had high mileage. The woman gave me a 10/30 and said that was what I needed so I bought 2 quarts and put 1 in. My car felt like it still needed oil. I put the 2nd quart in about 2 weeks later and it still didn't feel right. I went to Auto Zone to buy more oil and asked what type of oil my car needed. They looked it up and said my car uses 15/40 which is a thicker oil than what I put in it. I told them what oil I put in it and they said I need to get an oil change because the oil Pep Boys sold me was the wrong oil and it is going to mess up my car. I thought the woman at Pep Boy looked it up and knew what she was doing.and it angers me that she didn't care to take the time to look it up and just gave me any oil. Now it's going to cost me more money and I hope there is no damage already done to my car. Please respond to my complaint, thank you very much. Diana Blake, 209*898*4495. Had brakes done 7/18 are squeaking really bad. Original Pep Boys said nothing is wrong. Took to another Pep Boy and they said I need $700 work to fix it. If I don’t get this fixed correctly I will file a complain with better business and my CC company I charged the work on. I called three different Pep Boys locations. I got three different prices for the same work. extreme differences, Cleaning fuel injectors. Jonesboro Ga. $87.00, Peachtree City Ga. $147.00 Griffin Ga. $210.00 Griffin is the one I normally trade with! 2007 Jeep Liberty. On December 5, 2018 at 9:00am I taken my care to your store #6399 in Bartlett TN, because my car was leaking oil. I gave the keys to the customer service rep (Joseph Nelms) that was at the front desk. He pulled my car into the shop. About 15 minutes later while I was still in the store J. Nelms informed me that I was leaking transmission oil and not motor oil, and it appears to be coming from the lower and upper gaskets in the transmission oil pan. And if it's the lower gasket it could cost me $150, but if its the upper gasket it could cost up to $400. And he informed me that his mechanic will be in about 10:30am, and he can give me a better diagnosis when he shows up. I left my car and contact information with Mr. Nelms and left the store. About 2 hours later Mr. Nelms contacted me, to inform me, that the mechanic looked at my car and the leaks were indeed coming from both gaskets upper and lower. I gave him consent to proceed with the repairs. About an hour later, after I received the first call from Mr. Nelms I received another call from Mr. Nelms to inform me his mechanic found another transmission oil leak and it was coming from the Axle, and it will cost $229 to repair it. I gave him consent to proceed with the repairs. Around 5:30pm I received a call from Mr. Nelms letting me know my car was ready and can be picked up. Two weeks and a couple of days later I notice oil leaking from my car. I took my car back to the same shop/store#6399 in Bartlett TN on 12/22/2018 between 2 or 3pm. Mr.Nelms was not present at that time, so I was able to talk and voice my concerns to Mrs. D'Carlis Richardson and the mechanic that worked on my car. While Mrs. Richardson is looking over my invoice, the mechanic told me and Mrs. Richardson and I quote. "I KNEW YOU WAS GONNA BE COMING BACK, BECAUSE I DID NOT DO THE DIAGNOSIS ON YOUR CAR. I WAS GIVING THE WORK ORDER BY THE MANAGER AND I REPAIRED WHAT WAS ON THE WORK ORDER"!! Hearing this from the mechanic that worked on my car. I nor Mrs. Richardson could not belive what I was just said. Mrs. Richardson asked me to leave my car so the mechanic can do a proper diagnosis on it.I told her no because, I was heading to work, and I was going to be traveling for the holidays the next day, plus she had 2 cars in the shop and 1 ahead of me, and I did not want the same mechanic working on my car. So I agreed to bring it in the day after Christmas, and I did. When I brought my car back on 12/26/201/8 at 8:00am Mr. Nelms and the mechanic was present. I spoke to Mr. Nelms and informed him of the situation and what was told to me by the mechanic that worked on my car. He reviewed my invoice he written up on 12/5/2018, and the complaint that was wriiten up by Mrs. Richardson on 12/22/2018, on my byhave. I asked Mr.Nelms to have the mechanic come from the workshop and come to the lobby area and repeat what he told me in front of you? Mr. Nelms went back to the work area and spoke to the mechanic. NOT SURE IF HE SPOKE TO THE MECHANIC OR NOT!! The mechanic never came to the lobby after Mr. Nelms asked him to. So 15-20 minutes after me being there and speaking to Mr. Nelms. Mr. Nelms asked me and I qoute "Do you want your money back?" I told him yes. And I asked him was the mechanic gonna come talk to me? Mr. Nelms never gave me a respones. I have not heard from any representative at all..
16 Days later I returned my car back to the store#6399 to inform Joseph Nelms my car was still leaking oil. He was not their, so I voiced my concerns and complaints to the 2 customer representatives that were present at the time I arrived. D'Carlis Richardson and the mechanic that worked on my car 12/5/2018.While I was giving Mrs. Richardson all the information she need, the mechanic that worked on my car told me and I quote "I knew you were gonna come back, because I did not conduct any diagnosis on your car, I was just given the write up ticket to do the work". Mrs. Richardson asked me to leave my car and she'll have the mechanic look at it. I could not do that, due to the facts, she had 2 or 3 cars ahead of me, I did not want the same mechanic working on my car, I did not have another vehicle to get me to work that day. Mrs. Richardson then ask me to bring it back Wedsenday morning 12/26/2018. I did so at 9:00am on Wednesday 12/26/2018 morning. Mr.Joseph Nelms and the mechanic that worked on my car was in shop that morning. I was able to voice my concerns, what the mechanic told me about him not conducting the diagnosis on my car with Mr. Nelms, but not the mechanic. He chose not to come from the work area and speak to me on what he said. Mr.Nelms ask me and I qoute "Do you want your money back"? And I said yes I would. Then Mr.Nelms said he has to submitted a complaint to cooprate and it will take 5 business days for my funds to be returned to me. I have not recevied any calls or e-mails as of yet.. I been the 12 times for an alignment and soon as I leave.the vehicle pulls to the right.they forgot to tighten the lower control arm..I bring it back they aligned it again same results..I asked what is the problems..they say there is none.its same to drive after I did a inspection.the upper control arm was rubbing against the steering column shaft making it vibrate..so I could of killed someone or got killed.i spent on50 hours there and after I find the problems.they give me a refund.that the will not work on it again..25 year mechanical engineer said there is no problems.its safe.. I made a appointment for Monday Dec. 17th at 9:00., I told Jim Kuhlman what my car was doing and even had it checked out at Auto Zone which showed it was either spark plugs or the plug wires. He said they would diagnose the problem and call me. Three hours later no call so I called them and ask what was wrong with my car. He said they didn't know yet. They would call. Another three hours went by no call. I called again and was told still not sure and I had a few words to say to him. I was furious, how can you have, a car six hours and not know what was wrong with it. He said it would be ready at six. I called at six and he said they were putting it back together, so I got a ride. Everyone was gone and a lady gave me back my key. They had replaced three spark plugs. I started the car and knew right away it wasn't fixed. I didn't get out of the driveway before the engine light came on. It wasn't fixed. They knew it. I didn't pay the 541.72. It was reversed. They lied to me all day for nine hours. I got it fixed today by someone else who had it ready in less than two hours. It was the spark plug wires. I paid $350.00. This has happened to two friends I recommended also. I done with Pep Boys. I have a 2007 Hyundai Santa Fe. The car had two problems, a water leak and an oil leak. I wanted these items fixed. I stopped by the Pep Boys Hackensack, New Jersey Location. This was on November 21, 2018 just before Thanks Giving. The fellow I spoke to was Jonathan. Jonathan told me that they could not help me as they were very busy. He told me that if I could leave the car as the wait time was over 3 hours. I could not leave the car as I had to work the next day. I told Jonathan I would return in a couple of days. On Saturday November 24, 2018, the temperature dropped below zero and the water pump froze. This caused the alternator drive belt to break when I tried to start the car. I had the car towed to the Hackensack Pep Boys location so that they could fix the belt, the water leak and the oil leak. Later that Saturday evening I called to see what was going on with the repairs and they told me they could not get to the car as they had been very busy. They also told me that they could not work on the car on Sunday as the mechanics were off and they only did oil changes on Sundays. So they would be calling me on Monday (November 26) to let me know what was wrong with the car. On Monday I called as no one had called me back. Jonathan answered and said that the car needed an alternator belt and a tensioner. I should have followed my gut instinct that told me these guys were just going to rip me off. Jonathan said that before they could fix the water and oil problems they had to fix the belt and replace the tensioner first. The cost for this was going to be over $900. I said, “WHAT?” I almost jumped out of my skin when he told me the price. I told Jonathan that I wanted to speak with the mechanic. Jonathan said that the mechanic did not speak English, only Spanish. I told him that I spoke fluent Spanish and would like to speak to the mechanic. The mechanic basically said the exact same thing that Jonathan had been telling me. I agreed for them to do the work and Jonathan dropped the price from $900 to $750. He said he would try and help me out. $750 is highway robbery but I needed my car. Later on they called telling me the car was ready but I had to take the car to a car wash so they could power wash the engine in order to see where the water and oil leaks were coming from. My father who is a retired mechanic, told me it was not right. My dad had looked at the car before I had it towed to Pep Boys. He said all I needed was an alternator belt, the tensioner was fine. My dad also said that why get the car’s engine washed? They needed to open the engine to see if the gaskets and seals were compromised. My dad took me that Monday night to speak in person with Jonathan. I complained again but Jonathan stuck to his guns saying that they could not work on the engine because of all the oil that was on the engine. He told me to get it power washed and to bring in back so they could investigate why the car is leaking oil. My dad told Jonathan that the mechanic needed to open the engine. Opening up the engine is the only way to find out what is wrong with the car. Washing the engine would not prove anything. Jonathan seems like a know it all type person. He is a person that is always right even if he is wrong. I did not pick up the car that evening as I did not have my credit card to pay the $750. The following day I went back in the morning to pick up the car. Jonathan was not in. Another Pep Boys representative helped me with the bill. When I asked for the parts that had been removed, he told me that I had to make a request for the parts. Jonathan never told me that. I wanted to see the tensioner and since I had not requested for the old parts to be put aside, they threw them out. This is unreal! Every mechanic I have ever gone to has kept the parts for me to look at as proof that the work had been performed. The final price I paid was $731.79 and my car was still leaking water and oil. I took the car to a mechanic that was recommended by my father that same mornng. The following day they told me that the radiator was fine and the damages were some gaskets on the engine that had to be replaced. That was all. Something that the Pep Boys crew could not diagnose and were clueless. I am writing this complaint to inform Pep Boys Corporate of the low quality staff it has on hand. The work is lousy. I feel I was wronged by your mechanics and your field representatives. I could never knowingly refer a friend or family member to Pep Boy’s if this is how they will be treated. Hello, to whom it may concern. I had a unfortunate situation happen to me at the Carlisle pike location in PA. I had taken my suv in for simple alignment and balance. The first time nothing was done to car and the balance and alignment were completely off. After the second attempt and contacting Bob the name he gave me I brought in for a second attempt. The balance was ok not perfect and the alignment was still completely off. Out of the sake of not wasting anymore of mine or my families time I went to another garage and the situation was corrected. I am very disappointed in the service I was given and the trouble I have been put through. Bob assured me everything would be fixed this time. I was charged $52.47 and want a refund or credit for my time as I make $40 a hour and for the sake of this nightmarish experience. Bob tried to say everything was done correctly and this is simply not the case. My son and I went to pep boys in eastgate , Ohio on November 18. We wanted tire change and aligments my 05 Grand prix gt and his 02 GMC Sierra. We had back to back appointments starting at 9 am. It took them the whole time they were open. Hours 9 am to 5 pm. To complete the jobs. And we were there waiting the whole day. Because we live an hour away. My son and I are very, very disappointed and aggravated. If you'd like to reach my son and I considering this matter. Our numbers are 937-549-4177 House number 937-509-2641 my sons cell number. We look foward talking to you regarding this matter..
My son dropped his car off for tire and brake change and was quoted a price that was little too high so I called to speak to someone about it ,why call you may ask? My son has functioning Autism so we're trying to let him do things on his own .But back to the point, the employees of Pep Boys needs to learn how to treat customers with a little respect and not speak to them any way .I was in retail once and was told the customer is always right ,so Brian and Frank of Pep Boys on Scotland Road remember the customers are the ones why you have a job, and it would not hurt to be more courteous to customers . I read a couple of Reviews before trying pep boys and wanted to come to my own conclusions and i now know I will never use Pep Boys Again .Thank you and have a good day. On MondayClovis Pep Boys and look at the what was suppose to be broken I informed them that the clip had come off the fuel pump and nothing was broken. They never even told me what or how the vehicle was getting fuel. The work to diagnose what was wrong was never done, and the relay to the fuel pump was never checked or replaced. So why would a certified mechanic say that the cam sensor needed to be replaced at $209.00 and would not fix the problem and even replacing the fuel pump at $500.00 would not fix the problem when the $20.00 fuel pump relay is what needed to be replaced. I would suggest that you fix the way business is done at this location or look forward to a lawsuit for committing Fraud in the Penal Code. Michael C. Mello 559-572-2506 or e-mail man300mmello@hotmail.com thank you for your wisdom and understanding of customer service. I hope that you defuse this issue, so the Bureau of Automotive does not have to get involved. This was charged on my Pep Boys Credit Card for tracking purposes. I went to Pep Boys around 9a.m. (10/20/18) I asked if they would check my battery which I had bought from they about 4 years ago, The gentlemen was nice and got some one to do this right away. My battery registered really low and he said I needed a new one and it would take about 10-15 minutes. I waited about ten minutes walked to the restroom and it was locked. I asked another gentleman for a key, he left and came back saying both restrooms were out of order. I went back to the first gentlemen to asked how much longer it was going to be that I needed to use the restroom. He said about another 10 minutes and to try CVS. Them were locked also. I walked back to Pep Boys. Mr. Myran (mgr.) asked me can he help me I asked how much longer before I get the battery. He went in the garage, came back and said It will take another 20-30 minutes. I said the other guy said it would only take 10 and it has already been 20-30 and I really need to used the restroom and its locked. He said, "Thats no my problem" I said excuse me, he said it again and asked me if I had an appointment there were people ahead of me who did. I told him I wasn't told I that and that he was very rude. He got nasty. Then he said I am going to be nice and stop this guy (same guy who was helping me first) to do it. Is this the way your Managers run your business in front of your employees and customers? if so My family, friends won't be at your establishment again. I went into Pep Boys for a mobile1 oil change. The ad indicated I would get an oil change, new oil filter and my tires rotate for the cost of the mobile 1 oil change. When I went in to pick up my car I ask if the tires had be rotated as the ad indicated. The service representative stated that my tires did not need rotated and it was not done. I told him I had paid for it and would never return for service again. My car manual indicates I should rotate buy tires every 5000 to 7500 miles and my car had over 7500 miles in the tires. The service representative did not offer to rotate the tires but just ignored my request. I have used Pep Boys for over 15 years but will never use them again. I had the service done at the Rohnert Park Pep Boys. They did not honor an appt I made to get new tires. When I arrived I was informed they couldn't do the work today after all. I am taking my business somewhere else. I have been a customer with pep boys for years and I am not satisfied with the repair/ production that I received 7/06/2018 @ 7:09 P.M. I first took my 2002 Avalon to pep boys on 5/05/2018 @ 1:20 P.M. and I was called to come and pick my car up @ 6:00 P.M. on the next day 5/06/2018 (Tracking ID # 0121 2177013) and I spent $1,185.11 for the services that I brought the car in for plus additional services that I gave Mr. Rakentine to fix on my car, I was very satisfied with the services because my engine light and VSC light never came back on. A month later on 6/28/2018 @ 4:31 P.M. I left my car with Mr. Belcher and on 6/30/2018 he called me and said that he would replace the pressure sensor because it was on warranty but I would have to pay for the charcoal canister, I told Mr. Belcher that pep boys repaired my car on 5/5/2018 and the car been running great, why wasn't the canister identified then, this was on the 30th of June when he called me and gave me the report, I told him that the engine light and VSC light should have remained on during that repair service that cost me by surprise on 5/06/2018. I decline to have Mr. Belcher replace that canister because it was not fair to me that within a month the same problem comes back up, because of our conversation and Mr. Belcher disapproved my decision and never called me to inform me to pick up my car so around 7:10 P.M. 7/06/2018 my wife and I went to pick up the 2002 Avalon and on his signed service invoice tracking # 0121 2179108 we never discuss anything about the three General Comments at the bottom of the page. While waiting for Mr. Belcher to give me my keys and sign the statement at the bottom of the sheet, a woman came in telling him that she paid them $1,000 dollars to repair her vehicle and it is in worst condition before she brought it to Pep Boys, she said that she needed her car to go to work and she wasn't leaving until her car was fixed properly ( her wheels making noise-steering hard to steer)I believe that the store close at 8 P.M. that night. Since being serviced by Pep Boys no one have been under the hood of my car, the inspection of my car I noticed that the radiator that the mechanic replaced that the 5 1/2" plastic cable wire raceway box that's attached to the right side of the radiator both hold down points was broken and I found the washer and screw laying under the hood of the car on the battery side in the corner that is from that race way hold down box. I also noticed that one hold down bolt for the new installed radiator was broken on the left side and wasn't removed so that the hold down bracket for the radiator that was removed could be re-installed to prevent movement of the radiator. Mr. Belcher was upset with me because I didn't allow his team to install the canister under my car because of his confidence in his employee judgement, that would have cost me more money for nothing. The only thing that was needed was to have the VSC/VSC Off and the Engine light to go off the instrument panel was to tighten the fuel cap until you hear three clicks and hook up your electric tune up sensor cable under the dash and reset the engine light until it goes off which also reset the VSC lights to go off. Truly I am not satisfied with Pep Boys Services and I have three vehicles that Pep Boys work on for my family. NORFOLK, VA. 23502. REALLY REALLY BAD. First I was given a price at the parts dept. and I picked the Rotors and Pads best for MY 2013 Toyota Tundra Crew cab V-8 7.5 4 X 4. WAGNER OEX BRAKES AND ROTORS, With the help from the parts person. When I got to the service Dept. Got a different price. The only good help was from the parts guys. After I left I noticed that the service person used Wagner quick stop. NOT A HAPPY CAMPER AT ALL ! The entire day was "VERY UPSETTING" Other people had been there for 4 hours for simple work like a flat tire. One lady called IN A COMPLAINT . Another lady had been waiting for over four hours and then found out her car had been ready for 1.45 hours and no one called her. Several others came in with appointments from the day before and they had slipped other walk in in their spots. Then I saw the guy finish my truck and park it. No one at the counter notified me and just kept helping Walk Ins. I WALKED OUTSIDE TO COOL OFF AND WALKED DOWN THE SIDE WHERE THE BAY DOORS ARE. The entire parking lot from the the first row of parking all the way up to the bays doors have trash, nuts, bolts and various items that can puncture your tires. Just had $945 dollars Michelin tires put on Tuesday 3/5/2018. I went in ans notified the Service people and nothing was done, Asked the parts department and still nothing done. I cooled off and went back the next day and saw another Service Person, Looked like a service manager in white shirt. She was most helpful and pulled everything up on the computer. She apologized for the bad service and set me up appointment to have proper brakes put on. Still the parking lot next to bay doors need to be cleaned up " BIG TIME " before I bring my truck back or I want a completed refund so I can carry my Truck to Charles Barker Toyota. I checked the driveway and nothing has been done. THEY DON'T CARE. HOPE SOMEONE CALLS ME AND GETS THEM TO GET BETTER MANAGEMENT AND SOME AREA CLEANING. I WAS CHARGED $685.00 FOR REPAIRS AND GOT NOTHING FOR IT . AND MY CAR STILL BROKE DOWN ON THE ROAD. ENGINE LIGHT KEPT COMING ON. I TOOK THE CAR BACK IN TO THE LOCATION 1522. AND STILL HAD THE ENGINE LIGHT COME ON. . THE STORE # 1522 IN ORLANDO. I HAVE BEEN GOING TO PEPBOYS SINCE THEY HAVE OPENED. AND HAVE ALWAYS BEEN HIGHLY SATISFIED, UNTIL NOW. I recently went into pep boys in Destin Florida . I special ordered a tire due to damaging mine upon repair. The tire came in at 3:25, we took the rim and tire to get new one put on. We got there at 4:20. There was 2 guys in shop . We sit and waited for the tire to get put on about 45 minutes. So when they got my rim on the machine the worker was like it was his first day on the job. So after 45 minutes of trying to put tire on rim ,the other guy came over and tried putting the tire on rim and he failed. So the swapped machines after the other machine failed mounting the tire . So they tried for 20 minutes and still couldn't get it on. So one of them got mad and went in the office. So we set waiting and waiting then the manager came out and started to mount the tire. He tried for about 10 minutes and got mad and threw the breaker bar down on the concrete and stormed off. Then he was fussing and finally seen we was watching him and picked it up. He started again which he failed at mounting the tire. So here it is 6:30 then the original guy started again . Then he comes over and tells me he tore the tire. So at 645 I'm without a tire with truck on Jack's at the bank.. and now I still don't have nothing to put on my truck. Very poor service, very rude attitude, need better equipment for work being done at store, need more training. I will never shop at pep boys again. I own a construction company and have 20 service trucks which we use oep boys for all tires and worked done on them . But today ended my business with pep boys. Brake job done at store #1056. Many problems during warranty period, and they were never resolved. Brought to store #1645 since I moved from area of first store. Brakes unsafe and the store manager is very rude, inept, and verbally abusive. 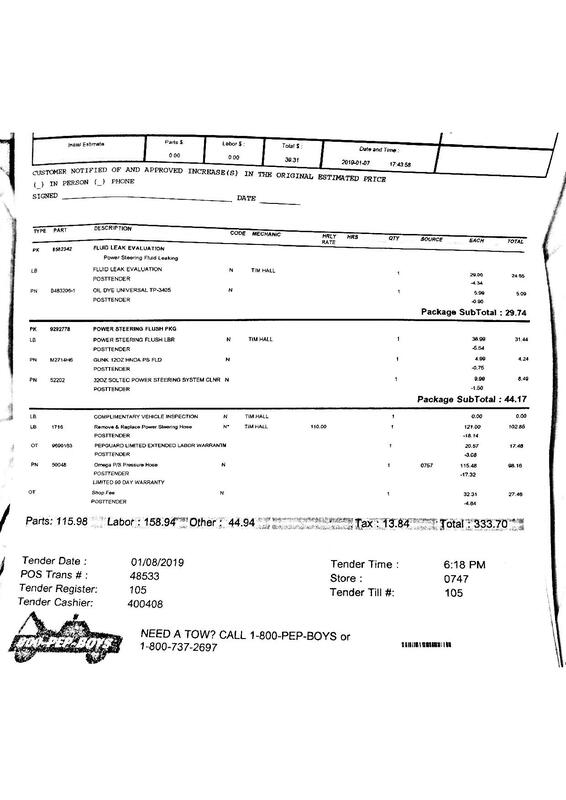 On top of all this they requested I pay an additional $200.00 to replace parts that shouldn't have to be. Too many more issues with Pep Boys to list here in one single review. Pepboys diagnostic was wrong. The car stopped again had to be towed back to pepboys again. The diagnostic said again computer head had to pay again to be fixed. They ordered the part took whole week than we called pepboys said come tow car didn't have tools to fix. towed to my dealership they fixed it was the crankshaft sensors. They fixed the car and it runs good. Was never the fuel pump or computer failure. Pepboys owe me for miss diagnosing. now know one seems to want to talk with me have made several attempts. I purchased a new battery for my daughter's car on 03/18/16. I forgot to submit my 10% coupon the day of the transaction. I realized it on 03/21/16 and returned to the store for them to honor my coupon. I was told it had to be surrendered the day of and I would need to contact the Pep Boys Corporate Office for a confirmation number to have this honored. I really think it's a bunch of BS. After being sent to see 4 different associates, this is what I was told. I'm just asking that my coupon be honored, nothing more and nothing less. I have a 2010 Chevy aveo purchased new with about 64,000 miles on it. My daughter drove it from my house to her apartment which is less than 10 miles. The car stalled once when she was at a stoplight. She called to tell us this and my husband told her to leave it alone and he would be over the next day to look at it. When he checked the engine he saw a gaping hole in the hose running from the engine to the radiator. The engine coolant had leaked out. We had the car towed to a nearby Pep Boys and they replaced the hose but the car would not start. We were advised by Pep Boys to take it to a chevy dealership because the engine is part of the powertrain warranty. As an aside, the dealership we purchased the car at closed soon after we purchased the car so we had it towed to another dealership, Drivers Village. Initially, they said they would have to get an ok from Chevy to diagnosis and do the engine work. Today they said that the hose was not part of the powertrain warranty and therefore the engine work would not be covered under the power train warranty. We were told by the tech at Pep Boys that the pressure in the engine must have gotten so great that it blew a hole in a big thick hose. Now Chevy is saying it won't cover anything and we have a car that will not run and still owe about $4000 on. The car had just had oil change and fluids topped off less than three weeks ago. We are going to place this information on all social media if we do not get a satisfactory resolution soon. Took my car in for a brake job and AFTER I paid they took it back Into the shop without my knowledge and drive it off the lift and caused damage to my car. Since then, I have filed complaints with corporate, called, emailed, etc. And have gotten absolutely zero answers or calls from corporate. Seems they really don't give a crap about their customers. I have been to Pep Boys several dozen times over the years for various auto parts and repair work on vehicles I owned. I picked Pep Boys because they seemed to be an established and trustworthy shop that had been around for awhile. Over the years I've realized that Pep Boys is just another large corporation that hires cheap labor. The mechanics seemed to not care about your car as much as how many cars they can repair quickly. I am not sure if Pep Boys corporate offices have a quota for the or something, that would make sense in the level of service I recieved. You car is something you shouldn't mess around with, going cheap can get you stranded by the side of the road in a hurry. I wish that companies cared about the customers needs and not the bottom line. 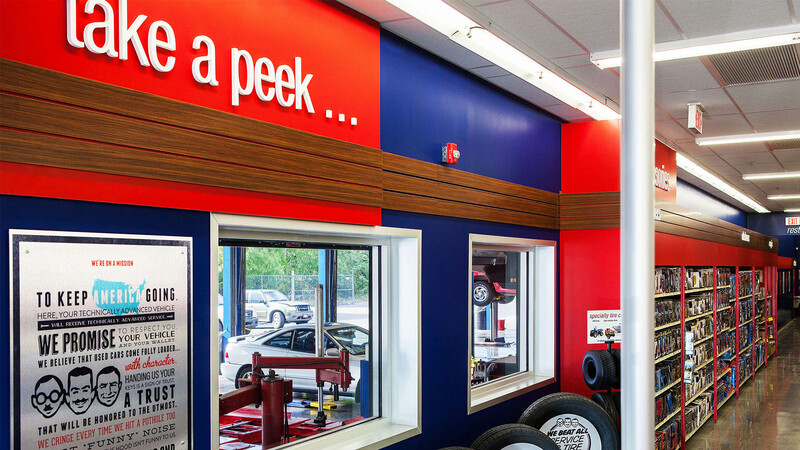 Have feedback for Pep Boys?